A detective goes undercover as a psyciatric patient to investigate a bizarre double murder. Audiences love a good twisty narrative, one that keeps us guessing while forcing us to work those brain muscles in a vain attempt to get one step ahead of the filmmaker. It's arguably the reason Christopher Nolan's movies rake in so much cash despite not offering the most commercial of narratives, Batman aside. Pulling off a movie that's so focussed on taking its audience for a mental ride can be difficult, and often character and atmosphere find themselves sidelined, as is the case with much of Nolan's work. 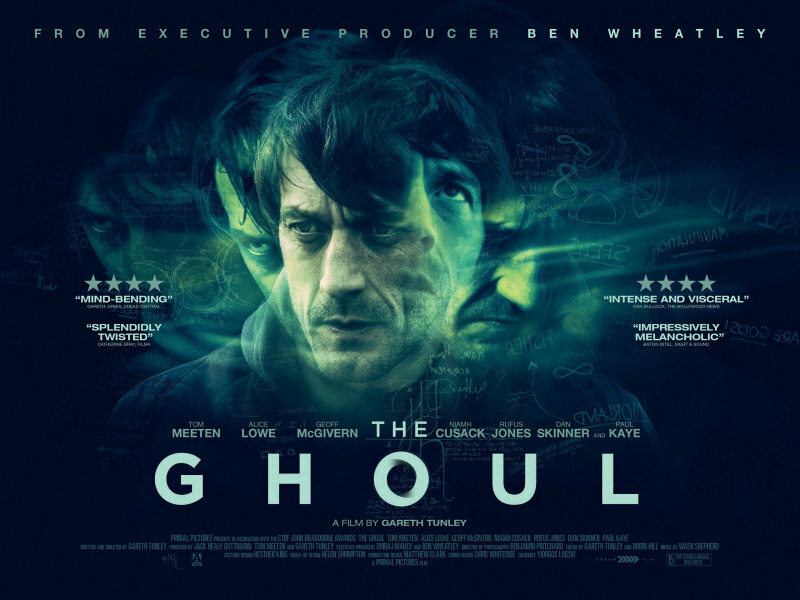 Actor Gareth Tunley's debut as writer-director, The Ghoul, is a rare movie that offers a twisty and elliptical narrative while functioning equally as well as a character drama. The film introduces us to Chris (a brilliantly bedraggled Tom Meeten), a homicide detective called to a crime scene with a bizarre oddity - two dead bodies which appear to have continued to move forward after being shot in ways that should have killed them outright. With no other leads, Chris decides to investigate the mysterious Coulson (Rufus Jones), a 'ghoul' known for hanging around crime scenes. Chris goes undercover, moving into a depressingly grim bedsit and booking sessions with Coulson's therapist, Helen (Niamh Cusack). As cover, Chris spins a story to Helen of how he's a depression sufferer who fantasises about a life as a homicide detective. Claiming she has become ill, Helen refers Chris to a colleague, Morland (Geoffrey McGivern, his character named as nod to the Boris Karloff movie from which Tunley's film takes its name), who conducts his therapy sessions at his own home, worryingly decorated with occult ephemera. The deeper Chris gets into his undercover life, the more he begins to question whether it is in fact his reality. Is he really an undercover cop or is he actually a depressed loner living a fantasy life? During one of Chris's sessions with Morland, the latter introduces him to the concept of the Klein Bottle, a vessel that contains itself, possessing neither an inside nor an outside. It becomes clear that Tunley's film is as non-orientable as Morland's prop, presenting us with a loop that will have you returning to the film's beginning once the end credits roll, much like Nolan's Memento, last year's UK indie Remainder or Shane Carruth's Upstream Color. As a thriller, it fails to compel quite as well as those examples. Tunley's televisual direction is flat, as is the drab cinematography, and the script at times relies too heavily on secrets unravelled through dialogue. The Ghoul functions better as a character study of a depressed, lonely soul in a big city. It's set in a curiously under-populated London, with Chris walking through streets devoid of any other souls, despite being in Europe's most populous city. It's a tragic story of unrequited love, as Chris has had feelings for an old college buddy, Kathleen (UK genre stalwart Alice Lowe), for many years, but has been unable to articulate them. Surrounded by nine million people, Chris can only focus on one. At a party, he connects with another woman and enjoys a one night stand, but refuses to answer her text messages, convinced his future lies with Kathleen. It's all too easy to dismiss someone like Chris as a narcissist, or his own worst enemy, but as he finds himself chasing the edges of a never-ending Mobius strip, the film makes it all too clear that his fate is out of hands. Ultimately, The Ghoul is a sympathetic and understanding insight into depression. The Ghoul is in UK cinemas August 4th.